This 1 1/2 quart sauce pan has a bonded aluminum base for fast and even heating on the stovetop. It’s also safe for use in the oven or under a broiler, to finish your cooking or keep food warm for serving. For easy cleanup, the pan is also dishwasher safe. The long handle is ergonomic, for a comfortable, secure grip even when the pan is completely full, and it stays cool enough to hold during cooking, so you won’t need a mitt. The handle is riveted on by hand so it will always be secure, and the pan has high sides and a narrow top that minimizes evaporation. Fill lines inside the pan make it easy to add the right amount of water or other ingredients, and pour spouts make it easy to empty the pan. If you want to drain the liquid from your cooked potatoes, the lid has straining holes that match up with the spouts. If you prefer a pan that’s a little bit larger, but you don’t want a huge price increase from our top pick, this 2-quart pan from Winware is your best bet. It is made of commercial grade stainless steel, and also comes with a heavy gauge stainless steel lid. A possible drawback with this pan is that it is on the heavy side, so it might be right for those with hand or wrist issues. It will resist staining and odors from your recipes, but some reviewers have reported problems with salt interacting with the finish—another good reason to only salt your cooking liquid once it is boiling. Skip the dishwasher with this pan and wash it by hand to prolong its lifespan. If you’re looking for a larger size Winware makes a version of this pan in 3-quart, 4-quart, 6-quart, 7-quart, and 10-quart sizes. This saucepan has a rounded, saucier-style bottom that makes it perfect for making sauces or cooking rice or other sticky foods, since there are no corners where food might stick. 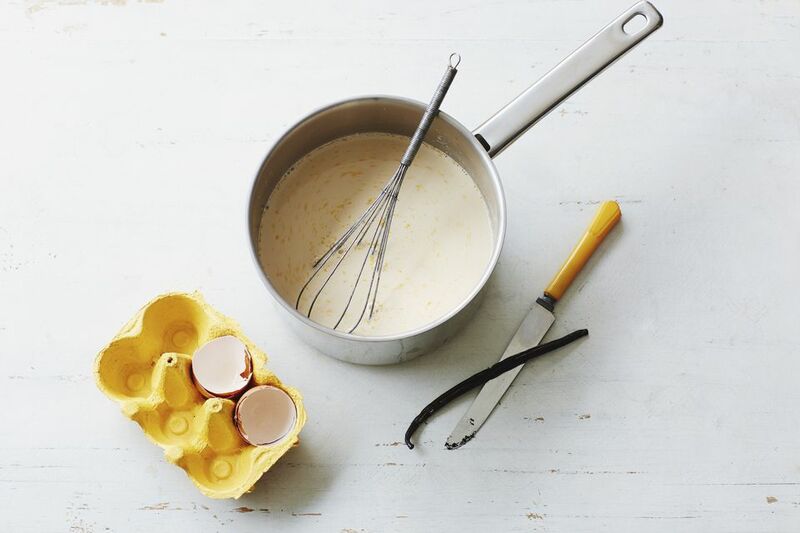 A whisk or spatula can scrape every bit of the bottom as you stir, for more even cooking and blending. The heavy construction reduces hot spots while the nonstick surface keeps food from sticking and makes cleanup a snap. Even better, the pan is dishwasher safe. The pan is oven-safe to 350 degrees. It has a long, comfortable handle stays cool during cooking. Since this is made from aluminum, it can’t be used on an induction cooktop. If stainless steel isn’t your style, and you want a nonstick pan, this anodized aluminum pan from Analon is a solid choice. The 2-quart saucepan has built in pouring spouts and a built-in strainer in the lid to make pouring and draining even easier. And the aluminum body and base of the pan guarantees even heating, so you won’t have to worry about hot spots and burnt foods. Unlike some other nonstick cookware, the commercial grade nonstick coating on this pan is incredibly long-lasting and can be used with metal utensils without risk of damage. It is also rated as oven-safe up to 400 degrees Fahrenheit. The pan should be hand washed instead of going in the dishwasher, but the nonstick coating means cleanup is a breeze. 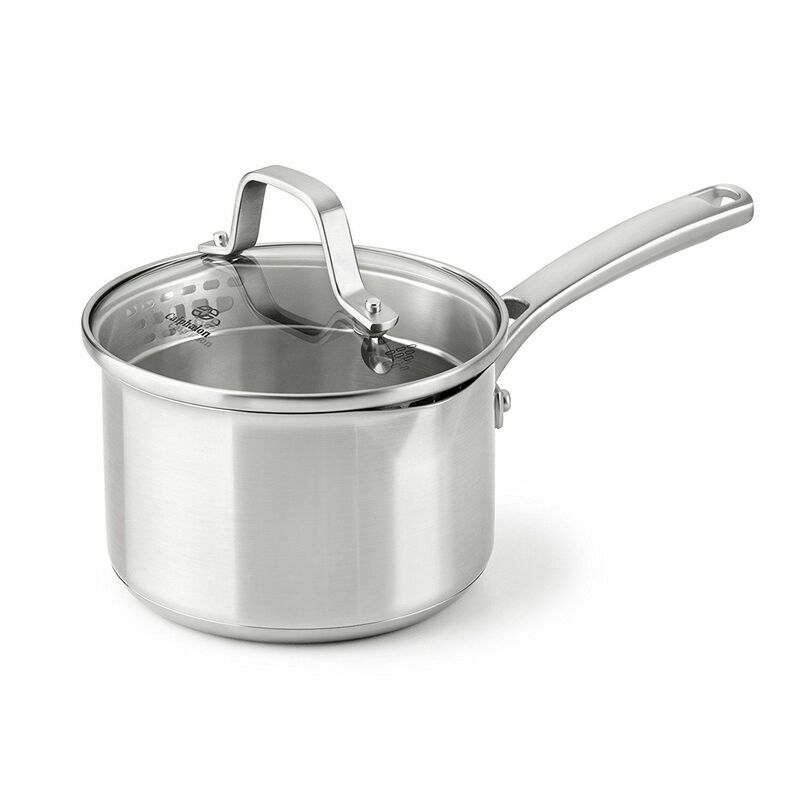 This small saucepan holds 1 1/2 quarts and has high, straight sides, so it’s perfect for making sauces, cooking small amounts of food, or heating liquids without excess evaporation. It’s made from stainless steel with an aluminum core, for the even heating throughout. The surface has a starburst finish to help prevent food from sticking. The pan has a contoured handle that’s easy to hold, the handle is riveted onto the pan for security. This includes a flat stainless steel lid. This is oven and broiler safe to 600 degrees without the lid, and can be used on induction cooktops. It’s dishwasher safe, as well. While this is an expensive little pot, it should last a lifetime. There are other pans available in this style, including a 1-quart pan if you need something even smaller. If you aren't looking for a lot of bells and whistles, this saucepan is a great option for college dorms, first apartments or someone who just wants an affordable option. It's PFOA free and has a non-stick coating so clean up is a breeze (it is also dishwasher safe!). It is larger in size (3 qt.) then the rest in this roundup so if you are looking for something small very small this isn't your best bet. It is oven safe, but only to 350 degrees and it has a glass lid so you can see how your food is cooking without losing heat. This Amazon choice has over 1,200 reviews which tout that it really is non-stick and is a bargain price for the quality. Just because you want to skip the chemicals in your cookware doesn't mean you will be left with a poor performing product. GreenPan is one of the leaders in healthy ceramic non-stick cookware and does all of this without using PFAS, PFOA, lead and cadmium so you won't have to worry if you overheat a pan or scratch it. With this purchase, you'll get a 1 qt. and 2 qt. pot so you can handle both smaller and larger kitchen tasks with ease. These pots conduct heat efficiently so you'll always get a perfectly cooked meal.